The Taco Topping Trifecta: Salsa, Guac, and Crema – Pao Says, "Open Wide!" 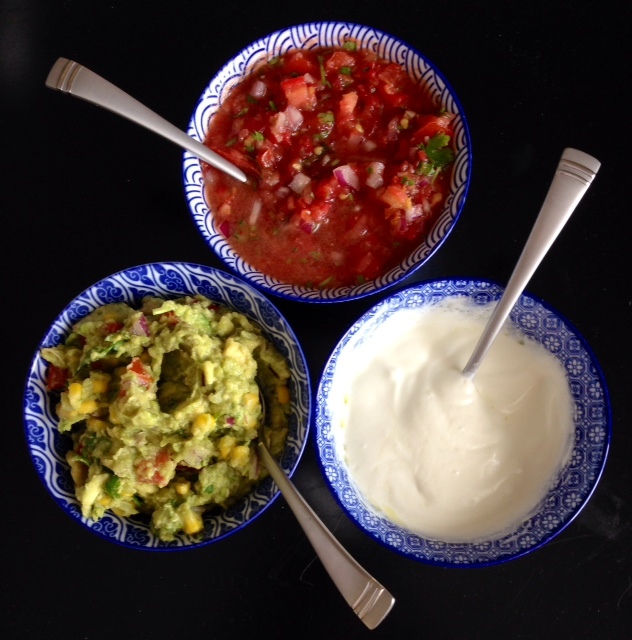 Salsa, Guac, and Crema- my trifecta of taco toppings. Each of these are home made and truly add something special to your taco fiesta that you really can’t get from a jar or package. All you need is a food processor or blender and some fresh ingredients! Jalapeño… OR! newly discovered- Chipotle peppers in adobo sauce… Gristides didn’t have jalapeños today so I had to find another way to add a kick to my salsa. Enter super spicy, kick-you-in-the-face chipotle peppers! They come in a can and can be found in the Mexican food area. I only had to use 2 small peppers and some of the sauce but they really added a smokiness along with the spice that I found to be really delicious and unique! will be trying these in more things. Stay Tuned. Put the onion, chipotle adobo pepper (or jalapeño), and garlic into the food processor first, just to make sure they’re well chopped up… it would be rough to bite into a half clove of garlic or a chunk of chipotle pepper in your salsa. Then toss 2 of the tomatoes (cut into 1/4ths), lime juice, and olive oil into the food processor. You’re not looking to make a salsa smoothie so don’t blend this like crazy, just pulse a few times to combine. Pour this into a bowl and add some chopped cilantro and taste it to gauge how much salt you should add. Remember, you can always add ingredients but you can’t take them away so be sure to taste the salsa as you go and add whatever flavors you think it needs more of. Make a good amount of this because it only gets better as it sits and the flavors all marry together. I like it even better the second day… or third, if it lasts that long. First, mash up the avocados with some lime juice and salt. Then, add all of the other ingredients and mix it. Taste for seasoning and add whatever you think it needs! Look at you… such a chef. Combine all of these things and you have a super easy, WAY upgraded sub for sour cream. Your tacos will never be the same.